In 2002 Sam Raimi signed one of the best superhero films: Spiderman, both superhero action movie and portrait of a troubled teenager. In 2004, it’s time for the hero to come back. 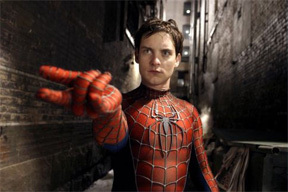 Spiderman was about how Peter Parker (Tobey Maguire) became Spiderman. Spiderman 2 focuses on why he continues being a superhero. While the first one was about a common issue in superhero stories – the birth of the hero – the second one starts from an amazing point of view: who wants to be a superhero? Peter Parker, the guy under the mask, has all the problems teenagers have when they are becoming adults: the triumvirate of job, studies, love. To make matters worse, he is Spiderman. So he has no time to study, he is always late at work and can’t afford the rent of his creepy room, and he loves a girl, but he can’t have her. Isn’t life complicated enough? That’s the point in this second coming of the adolescent hero, an amazing starting point. And for a while the film is Peter Parker’s life without being Spiderman. This second part is even better than the first. Comedy and reflection show up. Because after “who wants to be a superhero?” another question comes: who wants to become an adult? Spiderman 2 starts with a situation that fits better into a Ken Loach film than a superhero story. Parker loses his job because he is always late. Action will take second place here. The catchphrase of the first part, “with great powers come great responsibilities” could turn in the second one into “with age comes great responsibilities”. The film focuses on the issue of facing problems of adult life. One of the best moments here is the talk Peter has with his aunt, letting her know that his uncle’s death was his fault. Raimi keeps the shot of Parker explaining everything without a cut, which is not really common in action movies. The crisis Spiderman has makes him lose his powers. Then, the real crisis starts. Peter has to decide whether to remain a superhero or just go back to a normal life. The idea is another example of superhero duality: if Parker is not feeling fine, Spiderman’s powers disappear. Sam Raimi himself seems to have found the exact maturity needed to represent his character’s step to adulthood. He knows how to tell a complex story depending mostly on images. The moment Peter takes the decision to stop being Spiderman is as clear as in a silent film. We see Peter sitting on his bed, a track in shows the importance of the moment. No words needed, just the mise-en-scène and Maguire’s gesture. At this point the film cuts to Spiderman quitting, in a shot that evokes a panel of the Spiderman No More comic book: the hero leaving behind his suit (1). As Spiderman is losing his power Peter Parker is becoming the hero of the story. Tobey Maguire’s performance as a common guy is superb. Indeed, it is not the first time he has played an unlucky teenager: he already did it in Ang Lee’s The Ice Storm (1997). The difficulty of being Spiderman isn’t always taken seriously. Comedy is one of the film’s great strengths. Raimi even dares to make fun of the hero’s costume. One of the best sequences of the film is Peter taking his suit out of the washing machine and seeing then, surprised, that the suit has discolored. A funny sequence but also one full of realism. In another sequence he must use the elevator to go down from the top of a building as he has lost his powers. He meets a man who looks at him surprised and asks him about his “cool Spidey outfit”. So Raimi breaks with the conventions of superhero movies in both the screenplay and the mise-en-scène. 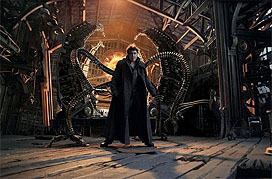 Like all superhero stories, Spiderman 2 depends partly on the villain, Doctor Octopus (Alfred Molina) who first appeared in number three of the Amazing Spiderman by Stan Lee and Steve Ditko. Doc Oc is doomed to live attached to four artificial arms that push him towards the evil in a Shakespearean scheming way. The idea is not new: the first film already had a villain who acted under the influence of evil voices, Willem Dafoe’s character the Green Goblin. Dafoe reappears again at the end of Spiderman 2, conspiring and asking for revenge in his son’s mind. It is already a forceful plot for the next volume. Indeed, Spiderman 2 is the set-up for the third part, but winks at the first one too. The scene of the hero helping some victims of a fire reappears, but while before it was Spiderman who went into the building now it is Peter Parker. And while in the first part there was a man badly singing about the adventures of the human spider now it is a woman. Once again evil appears because of an extreme use of science. Doctor Octopus is like a character in another Sam Raimi film: Darkman (1990). The deserted buildings where they hide look similar. Both transformed by the science they trust in, both devastated as they lost, in different ways, their wives. While Otto Octavius watches his wife being smashed by the machine he has created, Darkman is condemned to live far from the woman he loves and was about to marry. Both losses are magnificently represented. In Darkman the woman (Frances McDormand) sees the laboratory where her boyfriend worked explode. Raimi keeps the shot of McDormand watching and changes the background and her costume at the funeral. In Spider-man 2, as metal is being attracted by Otto Octavius’ machine, windows are broken and glass pieces fall on his wife’s face. There we can see her face reflected in the glass and then the glass reflected in her eye. Death is filmed in a crude way, but it is the breach where Doctor Octopus’ story starts. In both films the fact of watching plays an important role. At the same time, both men’s transformations take place in hospitals. Doctor Octopus’ first reaction after the accident is the most powerful action sequence of the film. The hospital massacre carried out by Octopus’ artificial hands is bloody and dark, but retains a B-movie touch that has always been present in Raimi’s filmography. Raimi films shadows and screams. Though there are no huge effects, terror is there. The shot of a nurse being dragged along by Octopus’ arm looks wild and simple at the same time. We don’t even see the machine, just the woman’s face and her nails scratching the floor, being dragged along into the darkness. From a sequence worthy of a low-budget sci-fi classic to the most spectacular climax – the fight between Doctor Octopus and Spiderman on a train – Raimi’s imagination has no end. At the train, action turns into emotion. After saving the passengers Spidey collapses and people pick him up. As he is without the mask Peter Parker’s secret seems broken. “We won’t say anything”, says a kid. “He’s just a kid. He’s my son’s age”, says a man. The communion between the hero and the people of New York is total. And the most human side of Spiderman is shown. After all, as the passenger points out, Spidey is just a kid. And emotion is Spiderman 2‘s last face. It is a comedy, an action movie, and a sweet melodrama. Raimi explains that he always enjoyed comic books as they managed to tell a story mostly through images. Similarly Raimi’s filmmaking is exciting for its visual strength, not only in action sequences. Peter Parker and Mary Jane’s bitter love story is filmed in a comparable way. Peter’s confession to M.J. about his Spiderman identity when she has already hung up the phone (we find a similar idea in Tim Burton’s Batman  where Michael Keaton tries to confess to Kim Basinger’s character that he is Batman) is shown in an emotive circular travelling shot. Other moments are just shown simply through a shot and reverse-shot. The most powerful moment is the representation of the “empty seat” that Peter Parker has become for Mary Jane. The idea, sometimes verbalised or accentuated, is subtly alluded to when Parker is sitting on the stairs outside a building. He disappears as he sees Mary Jane’s new boyfriend (2), she turns back and watches that improvised “empty seat”. The idea is silent yet strong, letting images tell the story. In the same sequence, as they are separated by the street, Parker’s eyes turn distracted following the cars that go by. A subtle explication of the hero’s dilemma: duty or love, being Spiderman or just being Peter Parker. One of Spiderman’s trademarks is the outline of his figure jumping across the buildings of New York. Raimi endows these famous images with depth. Spiderman jumps just like a kid with a new toy, letting all the adrenalin flow. While some people play video games or basketball, he wears a suit and jumps across the whole city. Once again, Spidey is just a kid, someone who needs to let his anger go after seeing the girl he likes in some other guy’s arms. It has always been like this and Raimi has perfectly understood the essence of the character. Sam Raimi seems to be at ease in Spiderman 2, a nice teenage portrait and an absolutely mature film. Let’s wait for a third part, which seems to start already in the second one through Green Goblin’s son, Peter Parker’s best friend Harry. It has been the time for maturity; now comes the time for revenge. If Spiderman was the birth of a new superhero, Spiderman 2 is amazingly better, a character’s and a director’s maturity. “Hors-sèrie Spider-Man 2”, Premiere, July–August 2004. The boyfriend is an astronaut whose father is Jameson, the director of the newspaper against which Spiderman/Parker works. This character was already in the comic book by Lee and Ditko.